In Buddhism it is taught that beings who are animals ‘evolve spiritually’ by being selfless and compassionate: so one day they may be reborn as human and have the opportunity to dedicate themselves to enlightenment. Animals have long been regarded in Buddhist thought as sentient beings, different in their intellectual ability than humans but no less capable of feeling suffering. Animals possess Buddha nature (according to the Mahāyāna school) and have potential to become enlightened. Buddhist doctrine on rebirth holds that any human can be reborn as an animal, and any animal can be reborn as a human. An animal might be a reborn dead relative, and if you looked far enough back your infinite series of lives, you would eventually perceive every animal to be related to you in some way. They could be our mothers, brothers, sisters, fathers, children , and friends. We cannot make a hard schism between moral rules appropriate to animals and those applicable to humans; ultimately we humans and animals are all part of a single family; all interconnected. I talk to animals all the time. More frequently to the ones I live with but also to ones I meet on walks or when I am driving and even to the animals I believe relate to me from the spirit world. I always ask the hummingbirds that frequent my feeders in the summer what message they have for me today. It brings me great solace when I see an eagle overhead especially if I am on a journey ( inner or worldly). I usually wave and give thanks. I could be accused of anthropomorphism but my spiritual practice begs to differ. Everyday I learn some new truth about myself, others, the human condition and the way of the world from animals. Some days it leaves me with more questions than answers but it always is a source of joy. Today I live in close relationship with thirteen animals; six cats, four dogs, a goat, a duck and a canary. The youngest and oldest are cats. 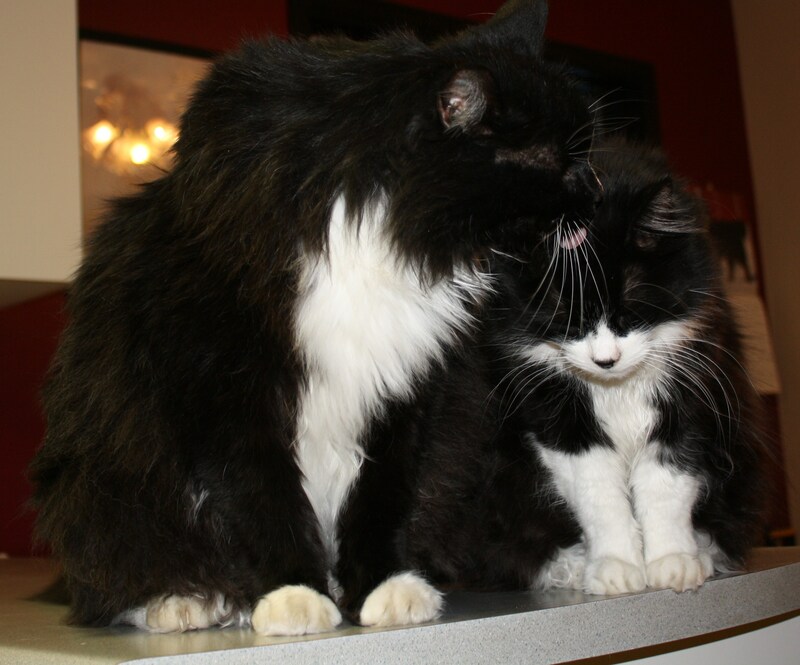 Sylvester is a 22 lb., long-haired, tuxedo cat. At fourteen years he has seen much. He reminds me of the panda in Jon Muth’s books. He ” combines the simplicity and elegance of a Zen teaching” with the joy of being a cat. Sylvester asks that, we all get along, don’t hurry through our life or we will miss the best parts and everyone be welcome. We have two extra cats because he invited a wild mama cat to come home with him to birth her babies in our wood pile. He cajoled us into feeding her and then letting her bring her two babies in the house for the winter. 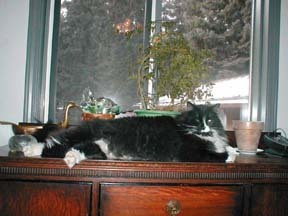 Sylvester takes long naps in front of the fireplace, long walks in pleasant weather, and long stretches every morning on awakening. He is never apprehensive to ask for what he needs, never concerned about sharing what he has, and will always impart affection if asked. Sparkle is a tiny black and white cat. Sure of her own ability to survive on mice, shrews and birds she is totally independent except for her love of Sylvester who she cuddles every day on the bed and me who she sleeps with every night. Loyal and loving and never bothered by the cat drama or new additions to the family. 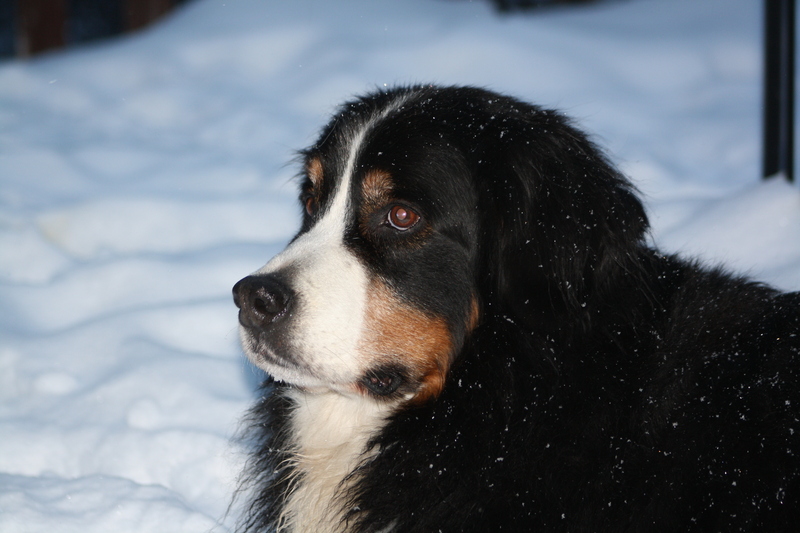 Noel is a twelve-year-old Bernese Mountain Dog. She is always happy. She is our first-born from our first litter. She held up the whelping process by becoming stuck and came out by caesarean section. I slept with her on the floor by the whelping box for three weeks. She gave us four beautiful litters and taught me that you love all your off spring forever. Where most dog mama’s will wean their puppies Noel would still let them have one more suckle before they went to their new homes. Noel knows that if you will only love everyone, never criticize, or lose your sense of play there is no suffering. She knows that others have different desires and aversions, and that’s okay. The ball retrieving obsession of a golden should never be discouraged because if you go along with it once the ball leaves my hand it becomes available to pat her head. Thus both dogs are happy. Aurora, the ball obsessed Golden Retriever. She is a “golden” one of creators angels. She loves everyone, unconditionally. 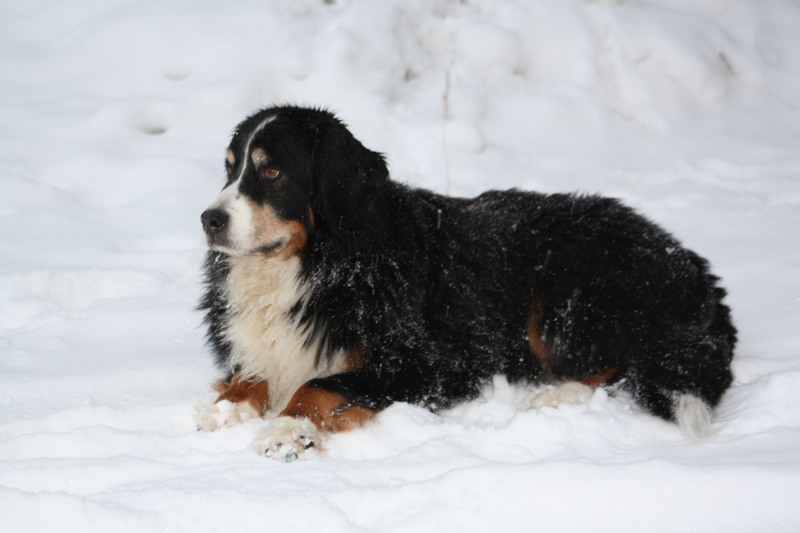 Echo is also a twelve-year-old Bernese Mountain Dog. She is my suffering buddha, and that’s okay. Her body is ravaged by a disease that is like ALS or Lou Gehrig’s in humans. It is degenerative and horrible to watch. There is no pain and no way for me to communicate to her what is wrong. We both suffer in our anguish of the inevitable. Death came December 30th. She stopped eating and that was our sign. My sister died from ALS and the ability to end Echo’s suffering through euthanasia opened a chasm of many questions for me. The federal court cases on right to assisted suicide launched by ALS patients is certainly an ethical dilemma. Would I have assisted my sister? I think so if she had asked. B. Noel’s son will always be known as his famous brother’s sibling. B is okay with that. He has no working titles and that’s my fault. He is capable and smart, but just wasn’t given the chance. B lives a dog’s life, doing what dogs love to do and maybe that’s enough? Mama and Marley, the wild cats. Shy and nervous they struggle daily with wanting to be loved and accepted with their fear of people and the unknown. Conquering fear is no small feat but everyday makes it a little easier. Bugger, my son’s cat. He was supposed to be a female named Bigira but when they took her to be spayed she needed to be neutered. Bugger is exactly that, a bugger. He struggles daily while learning to co-habit, share and be a friend. The girls are tired of his taunts and sneak attacks and he frequently finds himself alone while the others snuggle up together. He desperately want to be part of “cat sangha”. Vegas is his only friend and he treats him horribly. He will be enlightened one day and it will be sweet as his struggle to get there will be enormous. 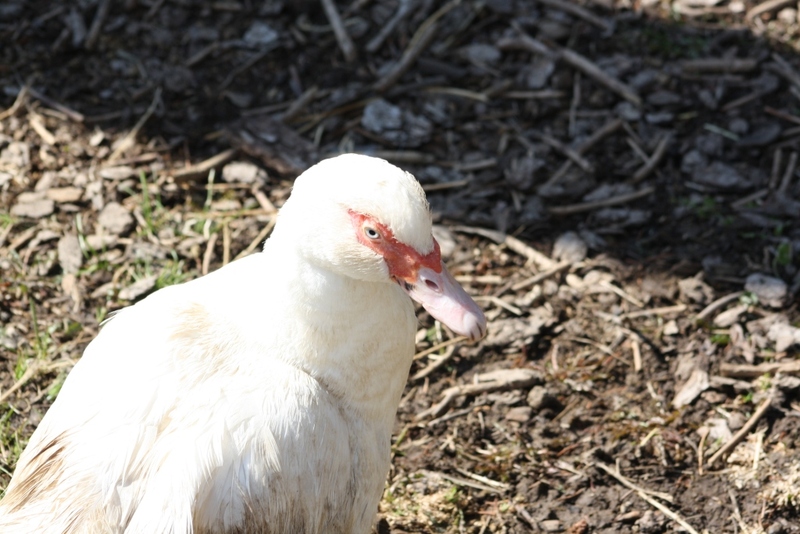 Cinderella, a Muscovy duck. 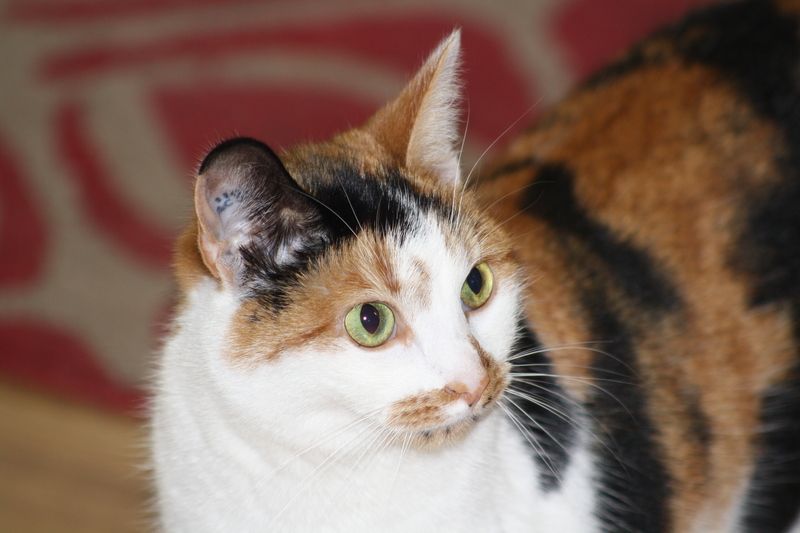 She is named Cinderella as she came to us as a rescue after the devastating fires of 2003. Found wandering on road by herself she was completely singed by the fire. A testament to endurance and how creator decides who lives and who doesn’t. She has been with us for 9 years. Verdi, the canary who baptizes me daily during my mediation by splashing in his bath tub. He adores Jack Kornfield and Kabat Zinn. Because he is isolated from the cats I put music, meditation or bird songs on for him all day when I leave for work. His newest favourite is Yo-yo Ma’s Goat Rodeo. 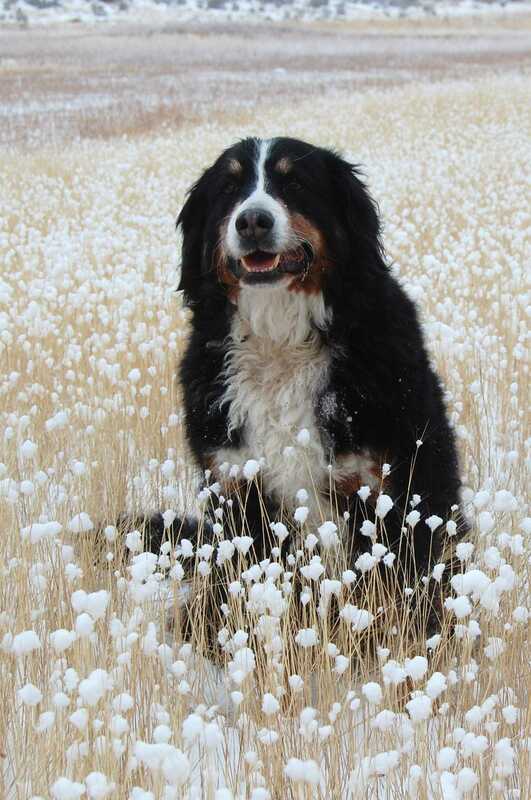 He is completely in tune with the seasons. Waking at sun up and going to sleep at sunset. His best friend is Vegas, the cat. They have grown up together. Why does he sing? He has a song, he knows no other life. Vegas, a cat that should have died. I brought him home from the shelter because he had pulmonary edema and no chance of survival. I knew that if I left him there his death would come from complications in his respiratory system as the shelter is full of the virus. I had an older female lop ear rabbit at the time and she quickly took him into her hutch and loved him completely. Cuddling him and licking him all over she breathed the will to live back into him. Our vet is still surprised that he is now 3 years old. You can still hear the faint gurgling in his lungs, if you can get him to stop purring. Vegas is a true Buddhist. He meditates at least three times a day. He knows the “universal” dharma door is open and I am sure that he has come and gone through it many times. 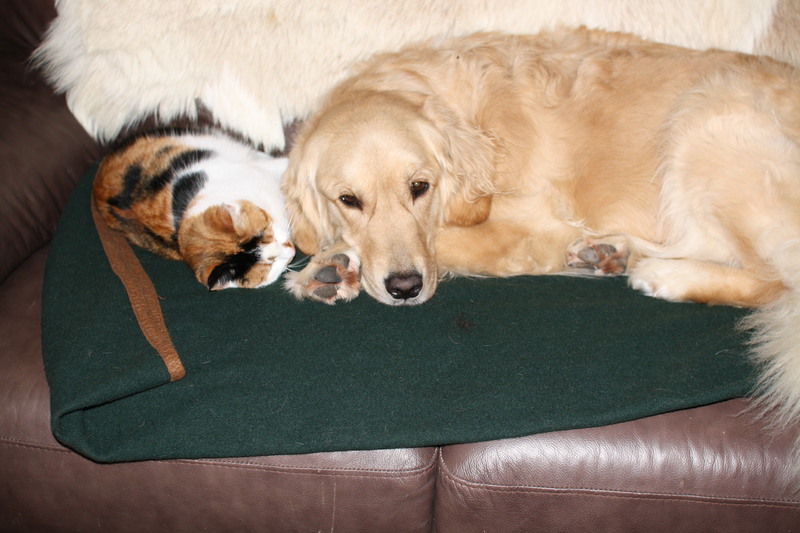 Bloggers note: Since I started writing this blog post Echo has died from the complications of degenerative myleopathy, Marley, the wild cat has disappeared and Noel is laying with laboured breath, not wanting to eat and not getting up. Her time left here is short. We survive … and then we die. Nothing escapes the Creator’s cycle. Not plants, horses, trees, birds, or human beings. Not the life of the mind. Not the life of the heart. Not the life of the spirit. All living things emerge, gather, spark new life, fall apart, die, and emerge in new ways. Each soul is a gust of God’s breath unfolding in the great energy that surrounds us like an evermoving stream. The goal is not to cheat death, but to live in the stream with a humility and aliveness that only an acceptance of death can release. When we try to deny death, we can grow sick from frantically chasing any challenge that will occupy our minds. In living the other extreme, we can grow sick from thinking only of death, from letting death be all that we see. This makes a sad career of fear. Beyond all design and desire, we survive, and like stones that are eroded by forces that can never be seen or stopped, our reward is the pain and wonder of baring our inner beauty to the sky. What we carry deep within, if we live honestly, will inevitably be worn outwardly. The experience of living this fully has nothing to do with removing ourselves from the Creator’s cycle. Too often, we struggle stubbornly in an attempt to protect ourselves from the friction of being alive, when it is precisely that friction that works our spirit into a seeable gem. We are more malleable than we think, more durable and changeable than all hope. Thin and fragrant petals do not hide from the wind. They survive to die and break ground again. Even within one life, we shred and re-root. We break, bleed, and rearrange into yet another beautiful thing that learns how to reach. Resisting this process doubles our pain. Singing our way through it is the source of wisdom and beauty. I am trying to sing.